One mile west of the Gulfarium and Boardwalk stands a lesser-known treasure of Fort Walton Beach. For 25 years, the Emerald Coast Science Center has served the region from its home near Landing Park. So whether rain hits the horizon or you tire of studying the seashore, visit the center to learn about everything from electricity to viscosity, motion to nutrition and more. Denise Mackin has been with the ECSC for only a short time, but she’s lived in the area most of her life. She remembers visiting the museum, and now she is proud to work here. 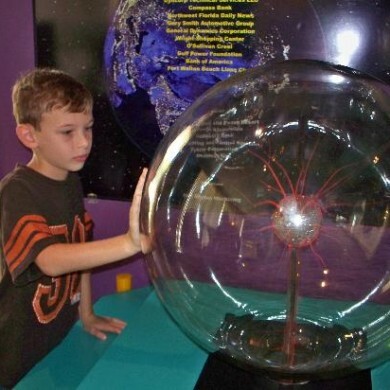 Believing that science is one of the most important fields in education, Tibbetts still teaches in the region and serves on the board of the Emerald Coast Science Center, which hosts in-house field trips for preschoolers to high schoolers – in addition to outreach with traveling exhibitions such as dissections and a pop-up planetarium. You can also celebrate your birthday at the center, with parties featuring a one-hour tour of the museum, a short activity like a ‘Dinosaur Dig’ or ‘Make-Your-Own-Slime,’ and goodie bags for each child. Keep your eye on the center’s calendar of annual events, including spring break and summer camps to educate and entertain your curious child. The center is home to animals, too. Meet reptiles and birds, then travel through a hallway of mirrors to the Hall of Life, where you can track food through the digestive system or see what your skeleton would look like riding a bike! Along the way, there are brain games to test your aptitude, a hurricane simulator and an explanation of the perpetually perplexing Jacob’s Ladder. During your visit, you’re bound to hear squeals of laughter as the young (and young at heart) discover the mysteries of the world around us. “Rainy days are our busy days,” Mackin says. But take it from us, they’ll be happy to see you when the sun is shining. The Emerald Coast Science Center is located at 31 Memorial Pkwy SW, Fort Walton Beach, FL 32548. For more information, visit the Emerald Coast Science Center website or call (850) 664-1261.